, which occurs when the AC joint in the shoulder becomes separated from your collarbone. Essentially, shoulder dislocations and shoulder separations happen in different areas of your shoulder, and therefore are separate injuries. 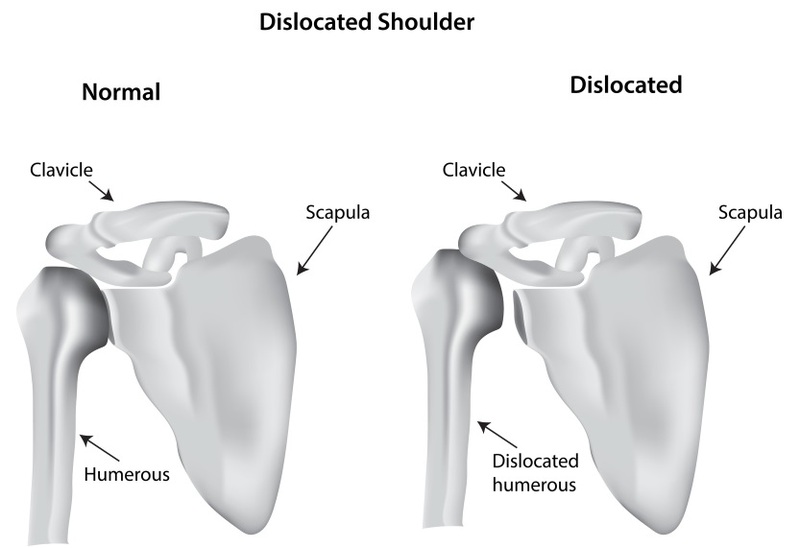 A shoulder dislocation is usually the result of trauma, such as an injury during sports or from falling. The shoulder is the most mobile joint in the body, but since it can turn in so many directions it also can dislocate forward, backward, or downward. The most common type of shoulder dislocation is forward, which means the upper arm bone has been moved forward and down out of the joint. This can happen when the arm is injured while in a throwing position, such as when a quarterback is sacked while throwing the football. The most obvious sign of a shoulder dislocation is pain. The joint may also feel numb or weak, and there may be swelling and bruising present. The patient will most likely have difficulty moving the arm. When looking at the shoulder, it may not look the same as it normally does, but this could also be due to the swelling. Your doctor will perform a physical examination and possibly take X-rays to make a proper diagnosis. As with any injury, your doctor will be the best source of advice on the appropriate treatment method for your situation. If you believe you have a shoulder dislocation, make sure you don't manipulate the joint until you see a medical professional who can move your shoulder back in place properly. Your doctor will select a method of anesthesia for the procedure, typically either intravenous (IV) where you are unconscious for a few minutes, or local, in which your shoulder will basically be numb. Your physician will then manipulate your shoulder until the ball of the upper arm pops back in to the socket. Pain will usually begin to subside as soon as the shoulder is put back in to place. After the procedure, you will likely wear an arm immobilizer or arm sling for several weeks. Once pain and swelling has gone down, your doctor will probably suggest that you have physical therapy to re-strengthen the ligaments in the shoulder and to regain range of motion. Patients who have had a dislocated shoulder are much more likely to have it happen again. If chronic (repetitive) shoulder dislocations begin to occur, surgical options may be recommended.